ReGive 5% 1 Year Fixed Rate Savings Bonds Too Good to be True? Whilst trawling through the internet, seeking a home for part of my dwindling cash mountain, I happened on what sounds like a too good to be true 1 year fixed rate savings bond paying 5% offered by ReGive, Who's ReGive ? I and probably most of you reading this will have never heard of this investment firm before that is seeking to hook interest starved savers with a high interest rate of 5% when the competition can barely muster 3.5%. The ReGive website contains many reassuring words and symbols including that of the FSA that implies FSA protection for depositor funds, however on digging deeper there is no such guarantee! ReGive is incorporated as an Industrial and Provident Society for the Benefit of the Community, registered with the UK Financial Services Authority (FSA) under the Industrial and Provident Societies Act 1965. This corporate structure exempts Re-Give from a number of FSA and other regulations and permits it to offer shares and bonds directly to the public. But what about being covered by the FSCS? Are you covered by the Financial Services Compensation Scheme (FSCS)? 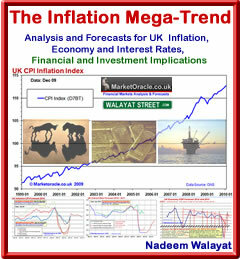 However, this does not mean that your investment is at greater operational risk. On the contrary, because we are not under the FSCS - it means that we are exceptionally careful, extra vigilant and especially prudent when looking after the funds under our management. I cannot be the only one seeing the flashing red danger sign? Isn't my money at greater risk if it is not covered by the Financial Services Compensation Scheme (FSCS)? The answer depends on what type of risk you are referring to. In general, you can save with confidence in the knowledge that all savings bonds are protected and backed by Re-Give: a global ethical financial institution, mutual society and savings specialist. What happens if you go bust? Re-Give's investor protection measures ensures that if it becomes insolvent – its administrators will have rapid access to investor funds so that they can pay back all investors quickly, along with any accrued returns. So let me get this straight, if ReGive goes bust then they will bail themselves out? The promises ReGive are making are not backed up with any details. So how does ReGive hope to pay the 5% return it is promising depositors? This is simply because we operate more effectively and our operational costs are far lower than most other providers - and because we don't function like a bank. Well that's clear, Re-Give is NOT a bank or building society. 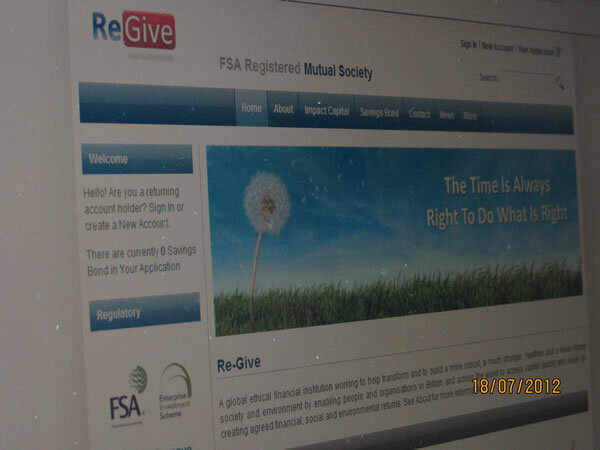 The FSA lists Re-Give as a limited company registered with them as of 21st Dec 2011 under the Industrial and Provident Act 1965. I can only imagine what the headlines in the mainstream press will be a year or 2 from now! The bottom line is these 'bonds' are NOT protected by the FSCS, therefore these 'bonds' appear to be high risk products, and I mean high risk investments, in my opinion depositors are at greater risk of loss than direct equity investments in large cap consistent paying dividend stocks. Seriously though, where is the FSA ? Sleeping again? They need to do their jobs asap else it is not going to look pretty for a number of people! Could it be another Ponzi scheme? It could be. A 5% return sounds too good to be true. I would stay away from this investment.